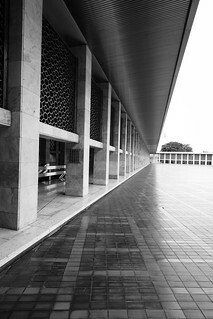 Istiqlal Mosque, or Masjid Istiqlal, (Independence Mosque) in Jakarta, Indonesia is the largest mosque in Southeast Asia in terms of capacity to accommodate people and building structure. This national mosque of Indonesia was built to commemorate Indonesian independence, as nation's gratitude for God's blessings; the independence of Indonesia. Therefore the national mosque of Indonesia was named "Istiqlal", an Arabic word for "Independence". I had heard about this building from Mum and since my wife hadn't seen it either (and she's lived in Jakarta for twenty years) I thought why not. First thing is your not allowed to waltz straight in as a foreigner. We (mostly because of me) had to see the Marketing/Promotions officer who explained that we would need a guide (him of course) and a donation would be required (a $1.00 seemed to suffice). He showed us through most of the areas but at each stage I had to ask permission to take photos - all in all a worthy visit and a big building.